Bens Self-cateringBens is an attractive property which offers spacious accommodation for up to 4 people. Formerly a wheelwrights workshop it has lovely views over Elterwater Common, the fells and a private patio area to enjoy the summer evenings. 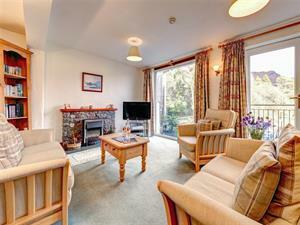 Leisure facilities available at Langdale Timeshare. Passes available to purchase from our office. Children welcome from any age. Bens offers weekly bookings starting on Saturday. From M6 jct 36, take A591 to Ambleside, follow signs for Langdale and A593, continue until Skelwith Bridge, approximately 2.5 miles then turn right onto B5343. Continue for a further 2 miles, go over cattle grid and take second turning on left into Elterwater. The Good Life Cottage Co. is the first building on the rhight-hand side, call in to collect the keys.